Donald Trump has said it was a “great honor” to meet President Barack Obama for transition talks at the White House. President Obama said he was “encouraged” by their “excellent” and “wide-ranging” conversation, lasting over an hour. During the election campaign, Donald Trump vowed to dismantle Barack Obama’s legacy and he has previously questioned his US citizenship. 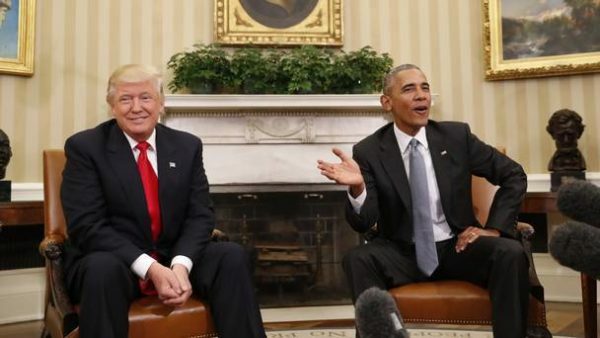 Barack Obama, meanwhile, had called Donald Trump “uniquely unqualified”. However, following Donald Trump’s shock defeat of Hillary Clinton in November 8 election, President Obama appealed for national unity and said he was “rooting” for him. He said they had discussed domestic and foreign policy and he had been “very encouraged” by the president-elect’s interest in working with President Obama’s team on issues facing the US. President-elect Donald Trump said he would “very much look forward” to dealing with President Barack Obama in future. “I have great respect, the meeting lasted for almost an hour and a half, and it could’ve, as far as I’m concerned, it could’ve gone on for a lot longer,” Donald Trump said. White House spokesman Josh Earnest said the two men did not resolve their differences but “the meeting might have been at least a little less awkward than some might have expected”. “President Obama came away from the meeting with renewed confidence in the commitment of the president-elect to engage in an effective, smooth transition,” he said. Donald Trump flew from New York on his private jet and landed at Reagan National Airport, just outside the nation’s capital. He was accompanied by his wife, Melania, who had a meeting with First Lady Michelle Obama. President-elect Donald Trump, along with Vice-President-elect Mike Pence, then met Republican House Speaker Paul Ryan, saying they “can’t get started fast enough, whether it’s healthcare or immigration”. Paul Ryan described it as a “fantastic, productive meeting”. President Obama congratulated Donald Trump in a phone call in the early hours of November 9. The defeated Hillary Clinton also told supporters Donald Trump had to be given a “chance to lead”.